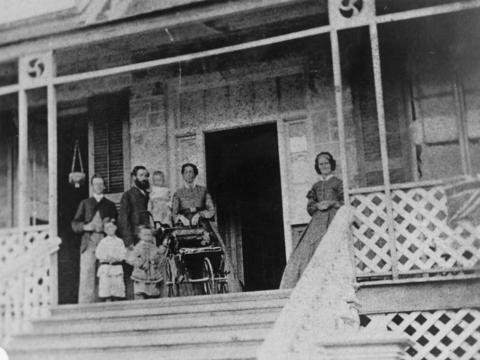 This image shows the Higinbothams and other relatives standing on the porch of their home "Riverview," situated at 5 Queen Street, Guelph. In front are William A. Higinbotham and John D. Higinbotham (holding doll). In the back stand W.Y. Smith, Lt. Col. N. Higinbotham holding Edward, Mrs. N. Higinbotham, and Miss Agnes Idington.